Check our Ticket page for info on admission prices this year. Library Arch Main Entrance – located midblock on 400 South between 200 East and 300 East). This is the main Festival entrance. Closest to the TRAX line and underground parking. Inside the Library (also Will Call) – located on the main floor of the Library in the SHARE Space. The Park Entrance – located on the corner of 500 South and 300 East. This entrance is perfect for large groups visiting the Festival and those with special needs. City & County Entrance (South) – located midblock between 200 East and State Street on 500 South (south side of the City & County Bldg). Next to the Art Yard, Toddler Zone and Face Painting areas. City & County Entrance (North) – located midblock between 200 East and State Street on 400 South (north side of the City & County Bldg). Sorry, we do not accept credit cards or personal checks at the box office - cash only! ATMs are available at the box offices as well as on the Festival grounds. Trax takes you to the Festival's front door at Library Square. Visit UTA's route schedule for more info. Bike to the FREE Bike Valet lot provided by the Salt Lake City Bicycle Collective on 400 South (just north of the City & County Bldg) and receive $2 off admission on Friday, Saturday and Sunday for your efforts. Bike lot hours are noon to 11:30pm. Downtown Salt Lake City has more than 30,000 parking spots. Check out parkingslc.com for the latest information, Parking Map, and apps that help you park downtown. Please obey all parking rules while you enjoy the Festival. Located midblock on 200 East, you'll find plenty of helpful volunteers, guides, maps, and other information to ensure a great visit at the Information Booth. Pick up some fashionable and fun Festival gear at the Festival Store. During the month of June, Festival merchandise will also be available at the Library Store, located on the main floor of the Library. Located on the east end of the walkway in front of The Leonardo, First Aid is provided by Salt Lake Regional Medical Center. Security is on the Library Plaza in the retail space next to the Library Arch Main Entrance. You will also find the Lost & Found at Security. 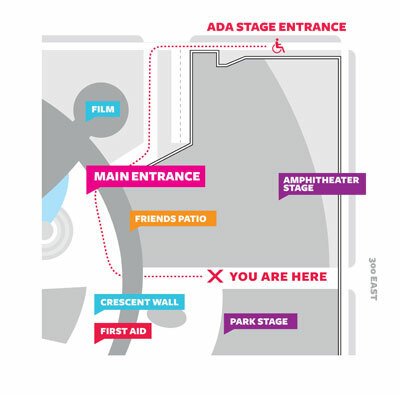 The Festival takes great pride in making the Utah Arts Festival accessible for all patrons. The staff, board, coordinators and vendors have all been apprised of the need to treat all our patrons with the utmost courtesy and be of assistance whenever necessary to ensure a pleasant experience at the Utah Arts Festival. We want your experience at our event to be stellar! If at any time you need assistance, please feel free to contact any staff person on site or contact Amanda Neff at 801-322-2428. Wheelchairs: A limited number of wheelchairs for patrons can be checked out free at all Festival entrances. Parking: The Library provides access to paid parking for those with disabilities in the underground parking garage, accessible from 400 South. There are a limited number of accessible parking stalls on 500 South near 300 East. Bathrooms: Accessible bathrooms are available at each bank of Port-o-Potties. Venue Access: While we take every effort to make the Festival site accessible, please realize it is a temporary, outdoor venue and there may be permanent structures erected that are beyond our control. Temporary ramps have been installed to make the venues at the Festival accessible. The location of our Amphitheater Stage, on the northeast corner of the Library Square, has only one ramp for wheelchairs that is located on 400 South, east of the Library's arch. A security guard will be posted at this location 30 minutes prior to all performances and until 30 minutes after the final act in the evening. If you need assistance with the entrance at anytime, please contact a security personnel or one of our box offices for assistance. The Festival footprint stretches from 300 East to the City & County Building and from 400 South to 500 South. Y'all Come Back Pass: Pick up a Y'all Come Back Pass at box office when you purchase a ticket to receive a 2-for-1 admission on your return visit to the Festival. Come all weekend! Inside the Library – located on the main floor of the Library in the SHARE Space. City & County Entrance (South) – located midblock between 200 East and State Street on 500 South (south side of the City & County Building). Next to the Art Yard, Toddler Zone and Face Painting areas. City & County Entrance (North) – located midblock between 200 East and State Street on 400 South (north side of the City & County Building). Near the Festival Stage, Epicurosity and the Sponsor Patio. There are several privately owned parking lots close by the Festival grounds ranging in price from $7-$12 (check out Parking SLC website for a lot of good info on lots and apps). Limited parking is also available underneath the Library. But the Utah Arts Festival is also proud to offer a great alternative to driving your car as part of our eARTh Team Environmental Program. Guests are able to ride their bikes to the Festival and park them FOR FREE at the Valet Bike Lot, run by our friends at the Salt Lake Bike Collective. As an added bonus, you'll get a $2.00 discount off a regular adult admission if you ride your bike to the Festival and use the Bike Lot. I need some special assistance. Is the Festival site ADA compliant? The Festival takes great pride in making the event accessible for all patrons. Wheelchairs are available for check out at all Festival box office locations. Designated handicap vehicle parking is available on the corner of 500 South and 300 East. Temporary ramps have been installed to provide wheelchair access on the grounds of the Festival. We also provide ADA-approved port-o-potties for individuals in wheelchairs. While we take every effort to make the Festival site accessible, we realize it is a temporary, outdoor venue and there may be permanent structures erected that are beyond our control to comply with ADA regulations. If at any time a patron should need assistance maneuvering on the Festival grounds, we are more than happy to assist. Please contact a security guard or box office personnel and they can arrange for assistance. Each year we distribute more than 8,000 complimentary tickets to agencies serving individuals with special needs. To receive an application for our Special Populations Program, contact . How do I volunteer for the Festival? We would love to have your help putting on the Festival! From set up to serving sodas, working in the Art Yard to booth sitting for the artists….we can use YOU! Click here for more information. May I bring my pet to the Festival? No animals are allowed on the Festival grounds. The ONLY exception is service dogs per new federal ADA laws that define a service animal as a dog. No other animals will be permitted on the Festival grounds under any circumstance. If you have questions about this definition, please consult the Department of Justice, 28 CFR Part 35, that deals with clarifying the definition of service animals as dogs for the purposes of public events. Why would you want to? We've got great food and beverages available inside, and that's part of the fun! No outside food will be permitted. Outside beverages, with the exception of a factory sealed water bottle, are prohibited. Free water is also available at various locations throughout the Festival. Is alcohol served at the Festival? Yes, we have beer and wine available for purchase. If you plan to drink, you MUST have and show a valid ID. May I distribute . . . (information, flyers, etc.)? No fliers, handbills, product distribution or soliciting is permitted. If you are handing out information or soliciting patrons you will be asked by security to leave the premises. Please contact our Development Director at if you have any questions. Can I smoke at the Utah Arts Festival? No. In accordance with Salt Lake City Ordinance, no smoking is permitted in city parks, recreational areas, cemeteries or near mass gatherings. What are photos taken at the Festival used for? We sometimes photograph visitors for promotional or archival purposes. Entry into the Utah Arts Festival or attending any Utah Arts Festival sponsored event grants permission for use of these images. For your safety, please remember . . .
No outside food or beverages, except factory sealed bottles of water, are allowed. No animals (except service dogs for special needs patrons). No bicycles – park them at our secure Blue Sky Bike Lot (located mid-block on 400 South to the north of the City County Building). No fliers, handbills, product distribution or soliciting.